ConservationFIT is launching this first phase with algorithm development for cheetah, jaguar and snow leopard. Why these species? There are several reasons these species were chosen. Firstly, they’re all in decline and at-risk from human:wildlife conflict and habitat destruction. Secondly, they tend to occupy habitats where tracks can be easily found. 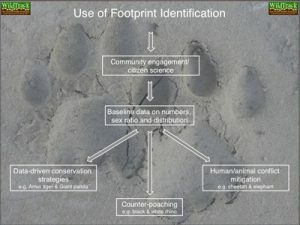 Finally, by working with the AZA Species Survival Plans (SSP) for cheetah, jaguar and snow leopard we will be able to quickly collect footprints to build the field monitoring algorithms.